Blondie and Brownie: It's Vendy's Time! It's Vendy's Time! 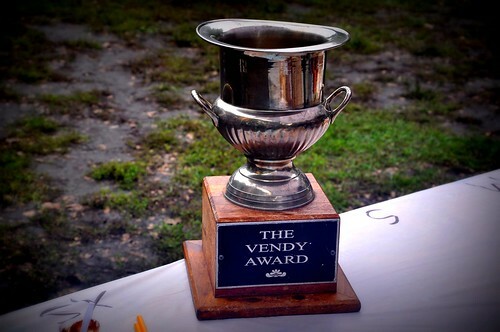 It's no secret that Blondie and I love the Vendy Awards, where the top street food chefs compete for the Vendy Cup and bragging rights of being the best of the best in New York City street food. How much do we love the Vendys? Let's just say we schedule our September around them. And this were there was tons of exciting news from VendyWorld, namely the nominees for the Philly Vendys and the opening of nominations for the big show, the Vendys on September 15th on Governor's Island. Who will be competing? It's up to you! Early bird discounted tickets have sold out. SOLD OUT, people. There are still general admission and sponsorship tickets available, but you'd better move fast because the Vendy's always sell out. ALWAYS. Want to see you favorite vendor compete for the title? Put in a good word for them! Nominations close Wednesday, July 25th, so get a move on it. Near term, I'm super excited to head to Philly at the end of the month for the 2nd Annual Philadelphia Vendys. Tickets are still available (though early bird tix have already sold out) and the tickets to the Philly Vendys are only $55 (as opposed to $95 for the NY Vendys), even with bus fare to Philly, it's still less. So what are you waiting for? Plan that day trip!